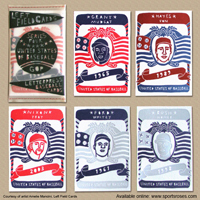 Left Field Cards are the creation of French-born artist Amelie Mancini of Brooklyn, NY. 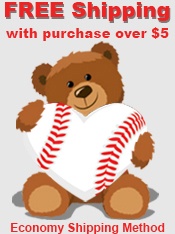 She fell head over heels for America's Favorite Pastime after attending her first New York Mets baseball game. Drawing inspiration from an old box of baseball cards, Amelie created her own colorful collection of off-the-wall baseball cards. 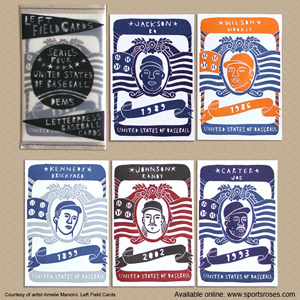 Left Field Cards are designed and printed by hand on a letterpress using premium, postcard-size card stock. 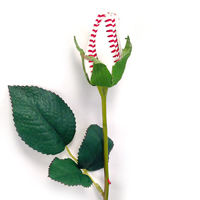 Instead of finding player stats on the back of the cards, space has been left to add a note, address and stamp to send a special thought to another baseball fan. Each series in the Left Field Cards collection is themed for curious "lessor-known" traits or facts shared by ten baseball players. The ten card series are split among two 5-card packs enclosed in an attractive handmade vellum wrapper sewn shut with thread. Collect them all! Add 5 more players that share a last name with a president to complete your collection.